I spent the last few days before christmas frantically knitting, crocheting and sewing. In the end, everyone got their gifts and seemed to like them, so I guess finishing things off at 2am on christmas eve night was worth it. It didn’t feel like it at the time though! 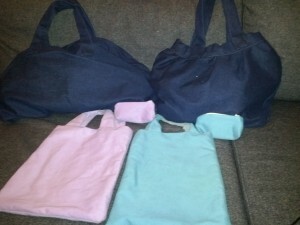 I made the kids school/shopping bags and purses, some of which are shown in the picture. I also made a scarf for one, a cardigan for another and a crown for the other one. It’s nice that they all have something made by me, especially as before now I have made things for other people and not got around to making things for myself or my family. I am still making a cowl for a friend (yes, it’s late, but she’s not in the country yet so it’s OK). Another project that was particularly difficult was a rope knit doormat which I gave as a gift as well. I had intended to make more than one, including one for myself, but it was extremely hard work and very time consuming so I didn’t get it done. Perhaps when I’ve forgotten how difficult it was I may pick up the rope and giant needles again. Although it was a bit hectic at the end there, I really enjoyed making gifts for people. It is nice to make something for someone in particular who you know will appreciate the effort you have put in. Next year I will have to be better organised and start much sooner!